DeatschWerks in-tank fuel pumps are manufactured with a quiet and reliable turbine impeller which is compatible with pulse width modulated pump drivers. These pumps are also built with carbon commutators and fully encapsulated armatures for ethanol compatibility. 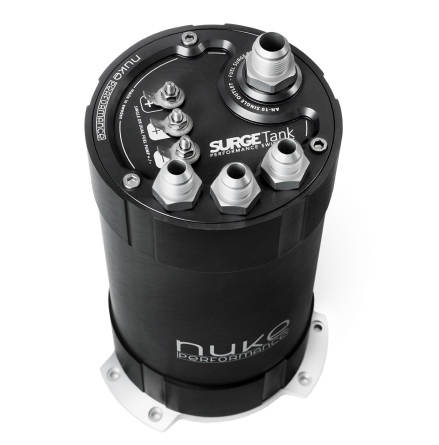 DW’s high-torque motors maintain flow at higher pressure better than competitors’ pumps. Low amperage draw minimizes pump temperatures, maximizes pump life and reduces stress on OE wiring. Universal fitment kits include filter, electrical connector, and other accessories to help with installation. All DW fuel pumps are backed by a 3-year no fault warranty. For more info about this fuel pump, visit manufacturers specifications. To us, passion is defined by true believe in performance. Nuke Performance is the by-product of a lot of sweat and tears that has shaped our knowledge, experience and expertise. Our commitment to develop the best of performance products comes from our history, our real world experiences and our passion for racing and motorsport. Whether it is engine or fuel demand, there is NO substitute for the performance, quality and reliability of Nuke Performance. This is what we fought for, what we believe in and what we want to share. Choose your preferred currency to view prices in our official webshop. NO HIDDEN FEES. SHIPPING INCLUDES ALL TAXES AND FEES.